AviaAM Leasing, a global aviation holding company engaged in tailored aircraft leasing, reconfiguration and trading services, has announced stepping into the consulting and advisory project of three Boeing 737-500 with European-based VIP charter company KlasJet. Within the project frame, AviaAM Leasing is taking the responsibility of providing full-scale consultancy and advisory services regarding acquisition, reconfiguration and maintenance of three Boeing aircraft, dedicated for VIP charter operations. Company has already assisted during the acquisition of the subject fleet and within further stages will assist with engines acquisition, scheduled heavy maintenance and aircraft repainting into the new livery. On the final stage of the services, AviaAM Leasing will coordinate all three aircraft full passengers cabin reconfiguration under VIP charter company’s standards and requirements, including business and executive seats preparation and installation works. “We are pleased that unique business charter airline trusted us arrangement of three aircraft, dedicated for VIP conversion. AviaAM Leasing has a proven track record and long-term expertise on implementing versatile projects like this, hence we hope this service based contribution will open up the door towards mutually beneficial cooperation with KlasJet in the future,” says Tadas Goberis, Chairman & CEO at AviaAM Leasing. 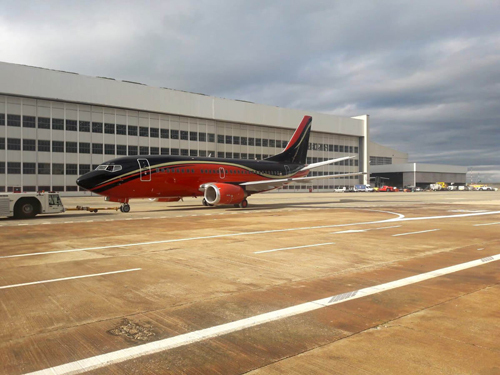 “Growth of KlasJet fleet is very important and exciting period for us, which heads company to significant player position in business aviation market. Upcoming new fleet is proving our readiness to meet various charter clients’ needs by providing exclusively detailed solutions. We are happy to have such experienced partner as AviaAM Leasing for our very important upcoming project and expect, that our cooperation will grow into a long-term partnership,” notes Dovydas Jurgelevicius, CEO at KlasJet.